Whale of a Tale is one of the most important documentaries I’ve seen this year and I know it will also be one of the least seen. The film is a text book example of how to make a fair and reasonably unbiased film but no one will see it because it doesn’t follow in absolute lockstep behind the Oscar winning film The Cove. Additionally if a distributor wanted to release the film odds are it’s far from black and white portrayal of life in the Japanese town of Taiji would inflame animal rights activists to the point no one would want to run it. Whale of a Tale is a deeper look at the town at the center of the events depicted in the Oscar winning film The Cove. 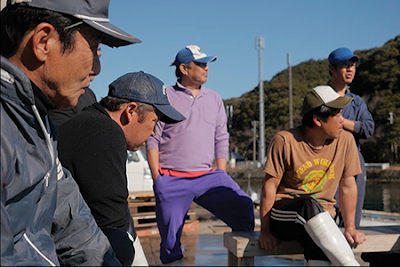 The film was a brutal look at the killing of dolphins in the Japanese village of Taiji. It focused on how the animals were driven into the shallow water and killed. It was a film soaked in blood and made to provoke a reaction. Using The Cove as a starting place Whale of a Tale returns to Taiji to look at the town, the people, the hunt and the protesters. It is a film that makes every effort to shine a light on every aspect of the story with the result the viewer is not quite as inflamed as one they were after seeing The Cove. Megumi Sasaki has made a brilliant film. A stunning piece of journalism the film walks us through the middle of everything so that we quickly realize that what seemed black and white is really much more gray. Sasaki's ability to do this is because she has placed at the center of the film journalist JayAlabaster an American who has been living in America. Sent by his bosses to get the story after the release of The Cove he quickly realized that there was more to the story than was being shown in the film. The people were not monsters and what was happening was nowhere as clear cut. Doing what any most people would never do he moved into the village and got to know everyone on all sides. Over the course of the film are opinions of everyone fighting over the hunt changes. The villagers soften from the monsters of The Cove into people we’d want to hang out with. We get to know them and their way of life. We see that there is more to what they are doing then slaughter for the sake of slaughter. (As they ask how is this different than how we kill beef or lamb). The protesters meanwhile are fare a little worse. While we can see their point of view they come off as gruff, one note and rather annoying. They scream and yell, shoot video footage but they make no effort to understand the people they are screaming at or the culture that enjoys the food. When one of the women in the village says that if the white protesters from America simply stopped telling them how to live their lives the hunt would stop you really believe it. Nothing inflames feelings for something like attacking one’s way of life, even if it’s a fading one. When the film ended I stared at the screen my mind racing. What did I just see? What does it mean? How do I feel? I’m still parsing that all out. Its been a long time since I’ve been affected on so many levels. I was moved both emotionally and intellectually. My heart went out to the villagers, while I was forced to consider how we treat the animals we use for food. While I’m not going to get into a discussion of animal rights the film made me really think about the issues connected with it.